The panel in question, that of the Adoration of the Mystic Lamb, is part of a 24-panel polyptych in the Cathedral of Saint Bavo in Ghent, Belgium. The work (oil on wood) was begun in c.1420 by Hubert van Eyck and completed by his younger brother Jan van Eyck in 1432. 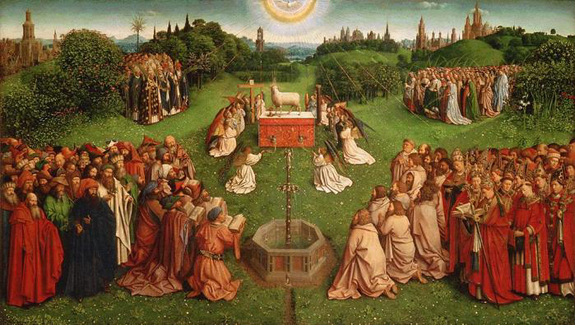 The aim of this article is to reflect on the way the theme of the Eucharist is treated in Van Eyck’s masterpiece: the Lamb on the altar is the Christ-Eucharist, the risen Lord made present in his Church by the Sacrament of the Eucharist and by the Holy Spirit (symbolised by the dove above the altar). The choice of depicting the Lamb in the Ghent altarpiece can be ascribed to the specific character of Flemish XV century painting, which tended to favour symbols as a means of conveying complex theological concepts. 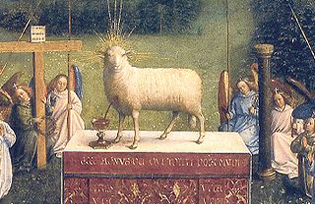 In Van Eyck’s painting, the presence of the Lamb on the altar carries more significance than the image of a simple ostensorium (which was quite common in paintings of the time), because in itself the Lamb summarises the many dimensions of the Eucharist, as the pivotal mystery linking the Old and New Testaments and as the anticipation of eschatological universal salvation. In this article I shall concentrate on four facets of the Eucharist shown in this painting: firstly the element of sacrifice; secondly the new life; thirdly the union between heaven and earth; and finally, the presence of Christ and the participation in His mystery. 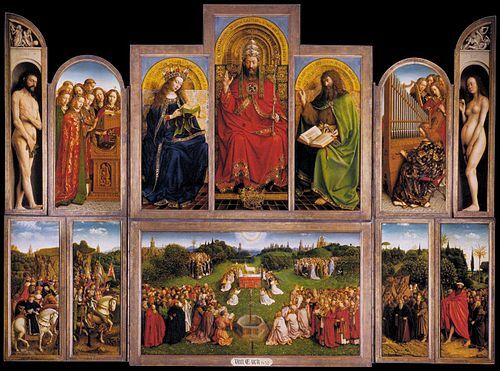 In the Ghent altarpiece, it is the sacrificial dimension of the Eucharistic mystery that is emphasized. The lamb has always been the symbol of sacrifice par excellence. In the Mosaic Law, the lamb had a propitiatory value as well as an expiatory one. Christ, like the lamb sacrificed at Easter, is the perfect first-born son, without sin. And like the meek and mild lamb, he represents the gentle, the pure at heart, and the innocent who never rebel against their persecutors. In presenting the figure of the Lamb, instead of Christ incarnate or the liturgical host, Van Eyck refers back to an ancient iconographic tradition. Christ is generally represented as a lamb from the IV and V centuries onwards, especially on sarcophagi (see John 1:29 and the Book of Revelations). Often the lamb is portrayed on top of a mount (Revelations 14:1) from which spring four rivers (Revelations 22:1 and Genesis 2:3) symbolizing the four gospels which reach the four corners of the earth. Facing the lamb, to its left and right, are other lambs representing the apostles Peter and Paul or deer representing the faithful. Framing the scene, there are often two date palms which symbolize eternal life (this iconography can therefore be interpreted as a theophany showing the victorious Risen Lord). The sacrificial Eucharistic aspect of the panel in the Ghent altarpiece is evident not only through the choice of the image of the lamb, but also through the clear reference to blood, which flows from the lamb’s wound into a chalice. (The image of the lamb with its breast pierced – the blood gushing from its wound collected in a chalice – begins to make an appearance in religious art from the Middle Ages). The chalice, as well as having a clear liturgical significance, refers both to sacrifice and communion. In the Old Testament, the chalice is often a symbol of sharing, joy and abundance: “My cup runneth over. Surely goodness and mercy shall follow me all the days of my life”(Psalms 23:5-6). In the New Testament, the chalice returns with a double connotation, alluding both to suffering as well as to sharing and redemption: “This cup is the new covenant in my blood, which will be shed for you” (Luke 22:20). In Van Eyck’s painting, the sacrificial aspect of the Eucharist is also emphasized by the red colour of the drape which covers the altar, with a dedication which reads: “Ecce agnus Dei qui tollit peccata mundi; IHES Via Veritas Vita”. Red is the colour of purification, of sacrifice, of mercy and of the infinite love of God. In the Jewish world, the “ashes of the red heifer”, a young, untried and flawless calf, were considered a means of purification. In the Book of Numbers, we read: “the priest shall take some cedar wood, hyssop and scarlet yarn and throw them into the fire in which the heifer is being burned” (Numbers 19:6). In the New Testament, the colour red recalls the passion of Christ, and his sacrifice for the salvation of humanity. Christ wears a red tunic; Justin Martyr and Tertullian interpret this as the life that Christ gives to mankind through the spilling of his blood. Augustine makes another parallel when he writes: “His garments, which he washes in wine, that is cleansing them of sins with his blood, undoubtedly represent the Church…”. The sacrificial aspect of the mystery of the Eucharist is also referred to through the instruments of Christ’s passion which are held by four angels behind the altar: a cross with a crown of leaves, a spear, a scourge and a sponge, a column and a rod. These instruments fit perfectly into their surroundings, as an integral part both of the verdant landscape and of the heavenly liturgy. While they constitute an eternal physical reminder of the sacrifice of Christ incarnate, they are somehow mystically transformed by the power of the Risen Lord, which pervades the whole scene. The Lamb on the altar is not simply a sacrificial lamb. It is standing, its eyes open, gazing directly at the observer, its head surrounded by light. In the Eucharist, in fact, it is the Living Lord that we adore: “Once I was dead, but now I am alive forever and ever” (Revelations 1:18). The very writing on the altar reminds us of that, referring to Christ not only as the lamb who takes away the sins of the world but also as “the Way, the Truth and the Life.” Christ is the sacrificial lamb of Easter (see Corinthians 5:7-8), not reclining but standing, because He has risen (see Revelations 5:6). And every man and woman, thanks to their encounter with Christ, sees his or her condition radically changed, as they receive a new life. Christ says: “I am the resurrection and the life; whoever believes in me, even if he dies, will live” (John 11:25). This new life is not an infinite period of time, but rather another dimension of human existence, in which the faithful are immersed through baptism (see Romans 6:4). In the painting of the Adoration of the Mystic Lamb, there is a clear reference to this new life, which the believer is introduced to through baptism and which is reinvigorated through the mystery of the Eucharist. This new life is evoked by the octagonal fountain (eight is the number of the day of the resurrection, understood as a new beginning, or new creation) with its twelve spouts, just as there are twelve apostles and twelve tribes of Israel (twelve is the number of fullness). From the basin at the base of the fountain, water flows into the foreground of the painting, almost towards the observer. The fountain can be compared to the river used in biblical symbolism, and in fact it carries the inscription “fluvius” (river) and not “fons” (fountain). There are many biblical references to the river as a source of life: from the description of Paradise in Genesis: “A river rises in Eden to water the garden; beyond there it divides and becomes four branches.” (Genesis 2:10). God himself is the source of living water, the river that gives life to the world: “As a deer longs for flowing streams, so my soul longs for you, O God.” (Psalms 42). When “the Day of the Lord” will come, “living waters shall flow from Jerusalem” (Zecharia 14:8); “wherever the river flows, every sort of living creature that can multiply shall live, and there shall be abundant fish, for wherever this water comes the sea shall be made fresh.”(Ezekiel 47:9). In the New Testament we find a correlation between living waters and the Holy Spirit: “Amen, amen, I say to you, no one can enter the kingdom of God without being born of water and Spirit.” (John 3:5). In his conversation with the Samaritan woman, Jesus points out the difference between ordinary water, like that from Jacob’s well, and the water He gives to the thirsty: “Everyone who drinks this water will be thirsty again; but whoever drinks the water I shall give will never thirst; the water I shall give will become in him a spring of water welling up to eternal life” (John 4:13-14). Whoever believes in Jesus Christ, will become a spring of water from this life-giving fountain. Jesus says: “Let anyone who thirsts come to me and drink. Whoever believes in me, as scripture says: ‘Rivers of living water will flow from within him’ ” (John 7:37). Jesus’s side, pierced when he was on the cross, recalls the fountain that flows from the ancient temple described by Ezekiel, whose waters spread throughout the world: “but one soldier thrust his lance into his side, and immediately blood and water flowed out” (John 19:34). And when the fulfilment of time will come, a “river of life-giving water, sparkling like crystal,” will flow “from the throne of God and of the Lamb” (Revelation 22:1). It is to this very river that Van Eyck’s painting refers in particular, as can be seen from the inscription adorning the rim of the fountain: et ostendit mihi fluvium aquae vitae procedentem de sede Dei et agni (“then he showed me the river of life-giving water flowing from the throne of God and of the Lamb”, see Revelation 22:1). The throne of God and the Lamb is the true source of the river of the water of eternal life. The very setting of Van Eyck’s painting -a luxuriant garden filled with plants and flowers- evokes this new life, which corresponds to the renewal of mankind after their redemption through the blood of the Lamb. From the earliest examples of Christian art, the representation of gardens and fields, borrowed from the Classical iconography of the locus amoenus, allude to the beatific life and thus to heaven. The garden of the Lamb is the paschal garden of the Risen Lord whose sacrifice transforms the whole earth into a Garden of Eden. Thus the city in the background of Van Eyck’s landscape can be interpreted as symbolizing the heavenly Jerusalem, the city of the living God. 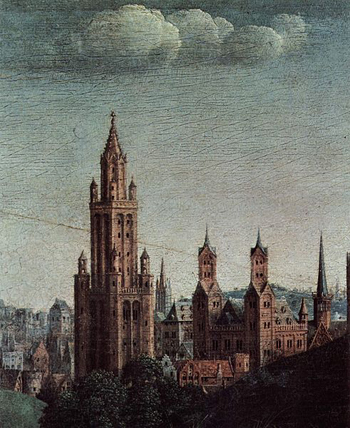 The buildings are therefore imaginary (even though two of them are recognizable: the tower of the Utrecht cathedral, to the left of the Lamb, and the dark tower of St. Nicholas’ church in Ghent, on the right in the group of buildings between the Lamb and the Virgins). The fact that the architecture of the city is Gothic naturally reflects the style of the period, but it also reveals a conscious choice made by the artist. We cannot know for certain whether Hubert followed the same pattern as his brother Jan, but it is interesting to note that the latter deliberately counterposed Romanesque and Gothic architecture in his paintings, with precise symbolic significance: the first as a reference to the Old Testament, the second referring to the New Testament (see for example the Friedsam Annunciation). It is possible that also the precious stones scattered on the ground in front of the fountain in the Adoration of the Lamb allude to the heavenly Jerusalem. There are many such references in the Bible. To the afflicted Zion, the Lord instils courage: “I lay your pavements in carnelians, and your foundations in sapphires; I will make your battlements of rubies, your gates of carbuncles, and all your walls of precious stones” (Isaiah 54:11-12). In the Book of Revelation too, the heavenly Jerusalem is inlaid with multi-coloured precious stones (see Revelation 21). The sacrifice of Christ allows the faithful to experience a new dimension of life; it allows them to enter mystically and sacramentally the heavenly Jerusalem. The Eucharist permits the faithful to move into another time, in such a way as to have a foretaste of the eschatological joy. In the words of John Chrysostom, it is Christ’s presence in the sacrament of the Eucharist that ‘transforms earth into heaven’. The Eucharist celebrated at the altar is the manifestation of heaven which has descended to earth. If this union between heaven and earth, or between man and God, were to have a colour, it would surely be that of the iridescent angels’ wings depicted in the Ghent altarpiece. The rainbow is the symbol of God’s grace and goodwill. In the Old Testament it represents the renewal of the covenant. When Noah abbandons the ark after the forty-day deluge, he offers his sacrifice to the Lord on an altar, and is blessed by God with offspring; the rainbow appears through the clouds as a token of the covenant between the Creator and all living things (Genesis 9:12-16). The rainbow is not only the symbol of God’s goodwill towards men, but also of his glory, as it recalls an other-wordly splendour. The throne of the Lord of the universe is described as follows: “Like the bow which appears in the clouds on a rainy day was the splendor that surrounded him. Such was the vision of the likeness of the glory of the Lord” (Ezekiel 1:28). In the New Testament, Revelation again takes up the image of the rainbow around the throne of the Lord who sits in judgement at the end of time. Thus Van Eyck’s shimmering angels’ wings are a reminder of the everlasting bond that unites all living things to their Creator, the deep communion established by the Lamb between God and man (Hebrews 9:12), and the coming to earth of the heavenly Jerusalem. The faithful who enter the heavenly Jerusalem through the Eucharist are not alone, but in the companionship of the saints – the multitude of the elect who are reborn through the blood of the Lamb: “These are the ones who have survived the time of great distress; they have washed their robes and made them white in the blood of the Lamb” (Revelation 7:14). 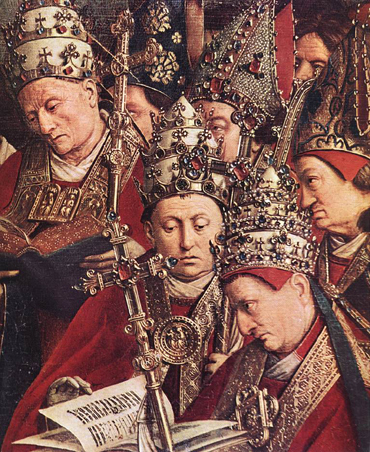 Although Revelation refers to the elect as dressed in white robes, Van Eyck uses a free hand in his depiction. He portrays them in the panel of the Adoration and in the four lateral panels as the various groups of people who are turning towards the Lamb. In the panel with the Mystic Lamb, the group in the foreground on the left have been identified as the main prophets of the Old Testament (Isaiah, Jeremiah, Ezekiel and Daniel) kneeling in the front row with books in their hands and the twelve minor prophets, behind whom throng the multitudes of all nations (see Revelation 7:9) including people who had not known Christ. Among these, the figure crowned with laurel leaves is thought to represent Virgil. The corresponding group on the right includes the twelve apostles kneeling in the front row and behind them the Christian martyrs identifiable by their red robes. There are three popes, six bishops and two deacons, a few monks and several lay people. Saint Stephen can be recognized by the stones he is carrying in his surplice and Saint Livinus, one of the patron saints of the city of Ghent, has his tongue held in the grip of the tongs which were used to tear it out. The group emerging from the bush in the background on the left are the confessors of the faith, in order of hierarchy. 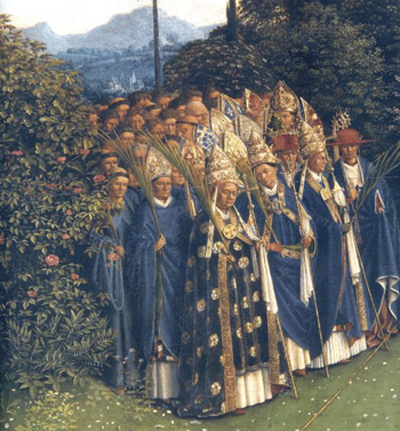 They are carrying palms but are not dressed in red (which shows they did not die a martyr’s death): popes, cardinals, bishops, priests and maybe some lay people as well. 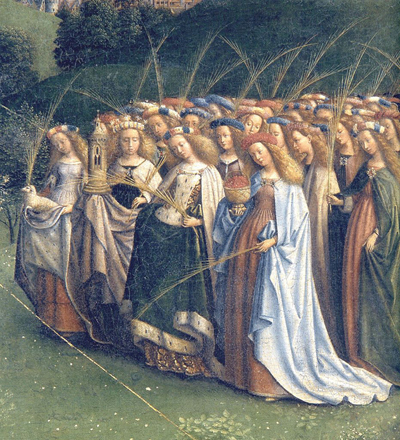 Finally, the group in the background on the right shows the women saints (both martyred and not), carrying the palm of victory and wearing flowers in their hair, along with other anonymous women (both religious and not). Among the saints we can recognize Agnes with her lamb, Barbara with the tower, Dorothy with the basket of flowers and Ursula with the arrow. The two side panels on the left of the polyptych portray the knights of Christ (including various sovereigns and probably leaders of the Crusades, like Louis IX, Godefroy de Bouillon and Charlemagne) and the Just Judges, i.e. administrators and politicians. The two panels on the right depict the hermits (including Mary Magdalene at the back, with her vase of unguents) and the pilgrims, led by a giant Saint Christopher, beside whom appears a man carrying the distinctive symbols of the three great pilgrimages to Compostella, Rome and Jerusalem (possibly Jodocus, patron saint of the altarpiece donor). Thanks to the liturgy, the people of God are gathered in the presence of the Risen Lord, grouped around his altar like the one communion of the saved. The liturgy reinforces and maintains this bond uniting all the Church: the Church of the living and the Church of the dead. In the liturgy, the saints are praised for their witness and God is thanked for having provided them to intercede for the faithful. The earthly liturgy becomes a mirror of the heavenly liturgy. This union between the earthly liturgy, centred on the Eucharist, and the heavenly liturgy, centred on glorifying the Risen Lord, is emphasized in the Adoration of the Lamb panel through the presence of fourteen angels kneeling in adoration around the altar: in the foreground two of them are holding aloft an incense-burner, while four angels behind the altar are carrying (as has been previously mentioned) the instruments of the passion of Christ. The Adoration of the Lamb mirrors both the unity of creation (men and angels, the works of man and those of God, city and nature), and the presence of Christ in His Church. The Eucharist is indeed the sacrament par excellence of such presence (in Van Eyck’s painting the Lamb is the Eucharist), which fulfils the promise made by the Lord: “And behold, I am with you always, until the end of the age” (Matthew 28:20). The presence of Christ is made real in the intimacy of man’s soul and within the Church by the Holy Spirit. For this reason, in Van Eyck’s painting, the dove representing the Holy Spirit is depicted in the centre of the scene high above the altar with its wings spread, surrounded by a halo of light. During the celebration of the liturgy, the Spirit is invoked in the epiclesis for the blessing and transformation of bread and wine into the body and blood of Christ. When the Spirit attains the heart of the believer, allowing him or her to know the Redeemer personally, then Christ’s sacrifice, which was made once and for all, is rendered eternal. The Spirit reminds the Church of all that Christ achieved (see John 14:26, 15:26, 16:12-15), and makes the Church deserving of making the offering to the Redeemer in its turn. And it is the Holy Spirit who vivifies the Church and all creation without ceasing. To emphasize the Spirit’s vivifying powers, Van Eyck has painted a halo of light-rays radiating from the dove which spread out over the panel, touching the various groups of people. In showing the Lamb of God as the Eucharistic mystery which gives life and unity to all the Church in an eternal present, this painting by Van Eyck encourages the faithful to contemplate and partecipate in the sacrifice of the Risen Lord. The absence of a celebrant at the altar evokes not only the fact that Christ is at once priest and victim, but also the fact that Christians themselves are invited to be a “holy priesthood” (see 1 Peter 2:4-5, Revelation 1:6, 5:10), and to take active part in the mystery of the Eucharist. The faithful are thus called upon in the Eucharist to offer themselves as a “living sacrifice”, binding themselves to the sacrifice of Christ: “Do not conform yourselves to this age but be transformed by the renewal of your mind, that you may discern what is the will of God, what is good and pleasing and perfect” (Romans 12:1). Those who saw the Ghent altarpiece were expected to be more than spectators – they were expected to feel personally involved. Flemish religious art in the XV century accentuated the devotional, mystical and interior dimension of the subjects portrayed. It reached out to the onlooker, endeavouring to arouse feelings of compunction and piety. More to the point, it was meant to encourage the faithful to be deeply transformed by Christ and imitate Him in their daily lives.